FAYETTEVILLE, N.C. – Last hockey season undoubtedly had to be one of the wildest of Paul Fregeau’s young career. The 25-year-old forward from Sylmar, California finished his NCAA DIII career at SUNY-Cortland, and proceeded to find his way to the Federal Hockey League’s Watertown Wolves for one game, before he was signed by the SPHL’s Roanoke Rail Yard Dawgs. He played in four games for the Dawgs, finding an assist, before being put on waivers. After clearing waivers, Fregeau returned to his collegiate-state of New York to rejoin the FHL’s Wolves, helping lead the franchise to the Commissioner’s Cup, the playoff-championship, where they overcame the Port Huron Prowlers. Fregeau finished his 2017-18 season with a total of seven goals (five at Cortland, two at Watertown) and 13 assists (three at Cortland, nine for Watertown, one for Roanoke. Prior to his professional hockey career, Fregeau was somewhat of a Junior Hockey journeyman, jumping from the now-defunct Empire Junior Hockey League (Tier III) all the way to the pinnacle of junior hockey in the USHL (Tier I), playing with the Bridgewater Bandits (EmJHL), Boston Bandits (EmJHL/EJHL), Lone Star Brahmas (NAHL) and Des Moines Buccaneers (USHL). 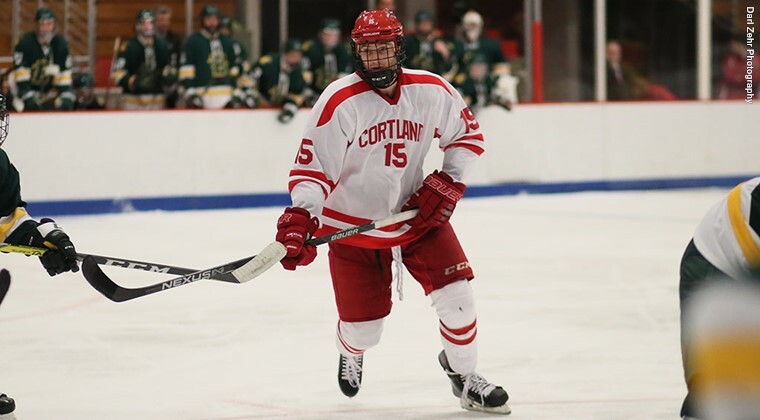 Following his 2013-14 season in the NAHL/USHL, Fregeau would start his collegiate career at SUNY-Plattsburgh, playing in just 14 games in two season, with 5 points (3G+2A). He would then head to SUNY-Cortland, where he would finish his NCAA career with 20 points (11G+9A) in 45 games. After his initial stint in the SPHL, Fregeau was hungry to get back, and was excited for the chance in Fayetteville. Head Coach Jesse Kallechy spoke of the abilities of Fregeau heading into the Marksmen Camp. With 36 days remaining until the SPHL season begins, the anticipation is starting to reach a fever pitch, especially as the Marksmen Camp roster starts to finalize, and the team’s exhibition against Macon has been set for October 12. The Fayetteville Marksmen are excited to welcome Paul Fregeau to his new home for the 2018-19 season, and look forward to him being the bedrock of what promises to be an exciting season of hockey in the Cape Fear. The 2018-19 Marksmen Home Opener is October 19th against the Roanoke Rail Yard Dawgs, and Season Tickets are on sale NOW!